Or at least that’s what it feels like. The little critters are everywhere underfoot! And they just seem to multiply at staggering speeds. None of them have homes anymore. They all seem to wander around the house aimlessly…waiting for greatness. Perhaps I’ll have to find some projects to repurpose my growing litter of legos. I’m thinking about having a little fun with lego wigs for our next family photo shoot – wouldn’t this actually be a blast for a kid’s photo? Not ready to put them on your head? Don’t forget these cool lego street bombs. I’m sure you can find a wonderful little spot nearby that is just screaming out to be loved with Legos! And when you add them to your own little corner of the world, you can upload them at Dispatchwork and claim your 15 minutes of fame. 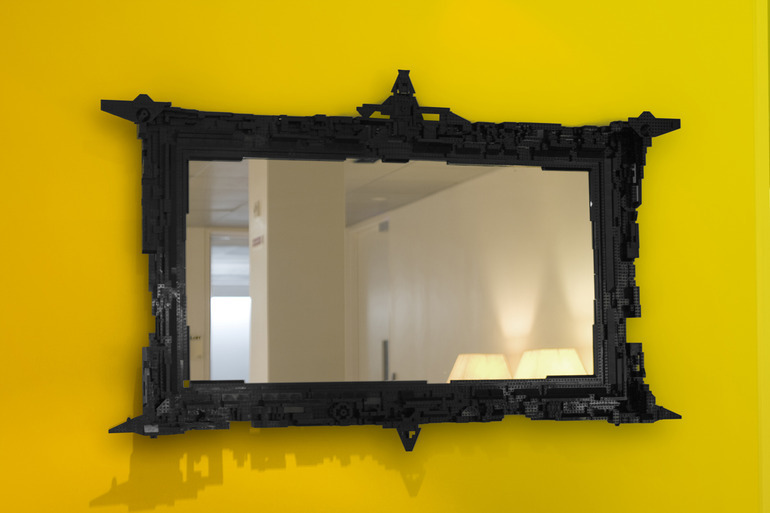 We definitely have enough to create a superstar lego mirror frame like this one. Makes me think of Star Wars. What do you think? Do I need to find new homes for my lego litter? Or should they be repurposed into something fabulous?